After three consecutive losses, the Lions host Carolina on Sunday. That game is followed by a Thanksgiving matchup with Chicago and another home test against the NFC West-leading Rams. There’s time for Detroit to rally, but the path forward looks difficult. The Lions (3-6) will face a Carolina team that’s in a much better spot, although the Panthers (6-3) are trying to rebound as well from their most recent outing, a 52-21 loss to the Steelers on Nov. 8. The 52 points allowed tied the most in franchise history. Pittsburgh scored on seven of its first eight possessions. The Lions and Panthers are in different divisions, but they did meet last season, when Carolina won 27-24 in Detroit. Cam Newton threw for three touchdowns in that game, and Stafford threw for two. The Lions are 28th in the NFL against the run, and now they’ll have to face Carolina’s versatile running back Christian McCaffrey, who has seven touchdowns in the past three weeks. McCaffrey has run 45 times for 201 yards and caught 14 passes for 150 yards during that span. McCaffrey has been on the field for 96 percent of his team’s offensive snaps, more than any running back in the NFL. Newton has thrown for at least two touchdowns in eight consecutive games, a franchise record. The Panthers will get to see how their much-improved team speed does in their first game this season on artificial turf. Carolina added D.J. Moore from Maryland in the first round of the NFL draft, while fellow wide receiver Curtis Samuel back after an injury-plagued rookie season. Detroit has allowed 16 sacks in the past two games, and the Lions put guard T.J. Lang on injured reserve this week. The Lions still have a couple of recent first-round draft picks on their offensive line in Taylor Decker and Frank Ragnow, but pass protection will be an area to watch this week. 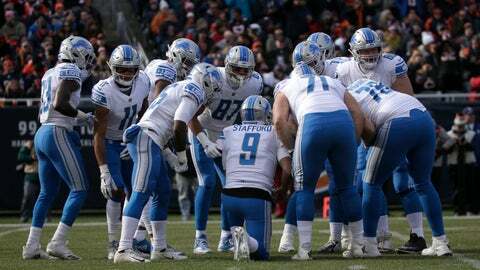 Detroit’s running game has improved a bit, but it wasn’t of much use last week after the Lions fell behind 26-0 in the second quarter of a loss at Chicago . DE Julius Peppers of the Panthers is still a factor at age 38. He had a sack in the game against Pittsburgh. Back in 2010, Peppers sacked Stafford, injuring his right shoulder. Peppers played for Chicago then, and he’s also spent time with Green Bay, so the Lions have seen plenty of him.